The Marjory Stoneman Douglas safety commission learned more about the failures of the school resource officer on the day of the shooting. NBC 6's Ari Odzer reports. Commissioners investigating the causes of the Parkland school massacre heavily criticized the actions of a sheriff's deputy assigned to the school campus, calling him a coward for not confronting the gunman. Members of the Marjory Stoneman Douglas High School Public Safety Commission said Wednesday that Broward sheriff's deputy Scot Peterson was "not a real cop," ''lacked intestinal fortitude" and was "a coward" as they reviewed video and photos of his actions during the Feb. 14 shooting that left 17 dead. Peterson did not enter the building to confront the alleged shooter Nikolas Cruz, but stayed outside. "It's a mindset, determination, he didn't have it," Polk County Sheriff Grady Judd said. His attorney did not respond to an email Wednesday seeking comment. Peterson is scheduled to testify before the commission Thursday. 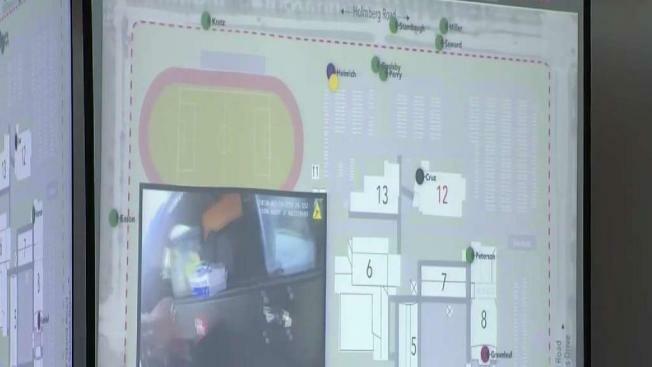 A step-by-step animation showed how close campus security monitor Andrew Medina came to intercepting the shooter. He recognized him, chased him, saw his gun bag and radioed another campus monitor, but did not radio a code red. "The failure to call a code red immediately cost dozens of lives," said commission member Ryan Petty, who lost his daughter in the massacre. "You have to do the right thing regardless of the policy." The commission also looked into Cruz's internet search records that show he looked up "school massacre" three months before the massacre. Pinellas County Sgt. John Suess told the commission that Cruz's searches about the 1999 Columbine High shooting in Colorado and other school massacres increased over the coming months. He also wrote about killing people, took photos of himself with guns, kept racist screenshots on his cellphone and in the minutes before the Feb. 14 shooting sent love notes to his ex-girlfriend by text message. "That's one of the reasons we encourage all media outlets to please don't say the shooter's name ... give him the glory which his kind seek," said Tony Montalto, father of victim Gina Montalto. Earlier Wednesday, the Broward Sheriff's Office announced Cruz was charged with attacking a jail guard on Tuesday. The Associated Press and NBC 6's Ari Odzer contributed to this report.